To infuse colour and vibrancy into Toronto’s winter landscape, a new international design competition was launched to transform the Beaches’ lifeguard stations into whimsical art installations. 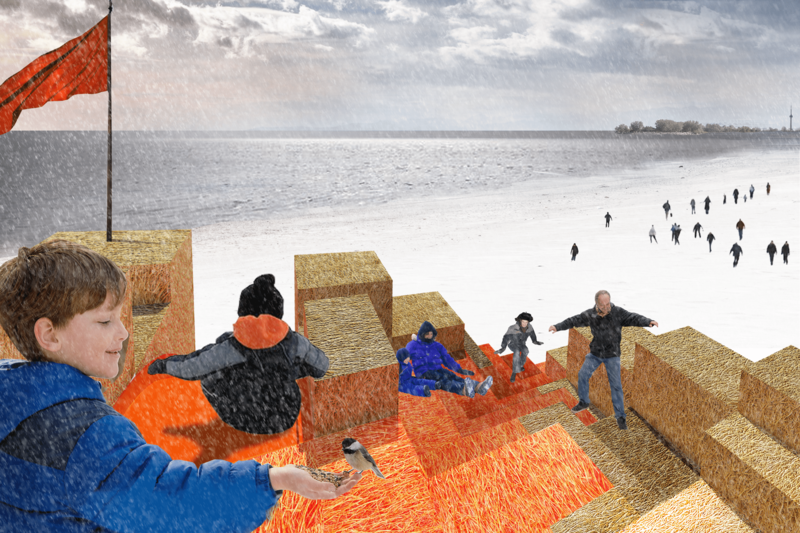 Paul Raff Studio submitted a straw bale snow fort design entitled “HAY, YOU!” This engaging climbable structure offers the pleasure of elevated lake views to the south, long views of the winter beach to the east and west, and the delight of a quick slide back down to the snowy sand. The design evokes warmth through movement, play, and cozy repose. A red painted banner beckons boardwalk pedestrians to circle around the big straw cube to the lake side. Scramble up the red bale terrace and survey the ramparts from this grassy belvedere. Take in the long prospect of the snowy shoreline and marvel at the view of the city beyond.